House Bill 1804, passed during the 2007 session of the Oklahoma Legislature and signed by Governor Brad Henry, will require local law enforcement, state agencies, municipal government and small businesses to enforce federal immigration restrictions. The new law, the Oklahoma Taxpayers and Citizens Protection Act (OTCPA), will take effect on November 1, 2007. ACLU of Oklahoma Legal Director C.S. Thornton and Program Coordinator Tamya Cox have been analyzing the OTCPA in conjunction with the ACLU National Immigrants’ Rights Project to determine what portions of the statute might be vulnerable to challenges on constitutional grounds. In addition, Thornton, Cox and Legal Intern Manish Rajwar have met extensively with representatives of advocacy groups involved with Oklahoma’s residents of Latin American descent. 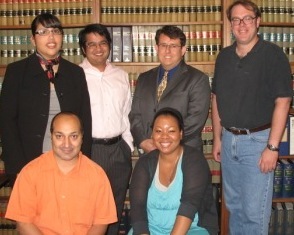 Affiliate representatives met in Tulsa with advocates from the League of United Latin American Citizens (LULAC) and other organizations on June 2, 2007. Later in the day, ACLU staff participated in a public meeting at Tulsa’s East Central High School with concerned members of the Hispanic community. A conference featuring a presentation about the OTCPA by David Blatt of Tulsa’s Community Action Project was held in Tulsa on June 5, 2007. The ACLU joined in discussion with representatives from advocacy groups and personnel from the offices of various state agencies in northeastern Oklahoma. Joining again with LULAC, the ACLU conducted two additional public meetings in Oklahoma City. These events were held at Southeast High School on June 23, 2007 and AMC Flea Market on June 24, 2007. The Catholic Archdiocese of Oklahoma City Pastoral Center hosted a meeting on June 27, 2007 that allowed advocacy groups and offices of state agencies based in Oklahoma City to confer about the ramifications of the OTCPA. David Blatt of Community Action Project repeated his presentation from the Tulsa meeting earlier in the month. As a result of the foregoing meetings, Thornton, Cox and Rajwar encountered extensive anxiety and anger about the impending enforcement of the OTCPA. Several advocates called for filing a legal challenge as soon as possible. The affiliate representatives had a difficult time in explaining the need for the ACLU to thoroughly investigate and deliberate prior to beginning litigation. The pressure to litigate was further intensified when a federal court in Pennsylvania declared unconstitutional a local ordinance that sought to punish landlords and employers for doing business with undocumented immigrants. The landmark decision in the closely-watched challenge to a Hazleton, Pennsylvania anti-immigrant ordinance held that the ordinance cannot be enforced. The lawsuit was brought on behalf of Hazleton residents, landlords and business owners by the American Civil Liberties Union, the ACLU of Pennsylvania, the Puerto Rican Legal Defense and Education Fund, the Community Justice Project and the law firm of Cozen O'Connor. The ACLU and co-counsel successfully argued that anti-immigrant laws like Hazleton's are unconstitutional because they usurp federal immigration policy, fail to provide procedural protection to people before they are fired or evicted, and violate federal civil rights law. Although many Oklahoma activists were emboldened by the success in court against the Hazelton ordinance, the ACLU of Oklahoma was concerned that the special challenges in litigating against a state statute would be more complicated than challenging a municipal ordinance. Therefore, Thornton contacted Omar Jadwat, Staff Counsel for the ACLU National Immigrants’ Rights Project. Jadwat, a member of the legal team that successfully challenged the Hazleton ordinance, agreed to consult with the affiliate and to meet with activists and the general public in Oklahoma. Jadwat visited Oklahoma for a few days at the beginning of August. He met with affiliate staff and two representatives of the Mexican-American Legal Defense and Education Fund (MALDEF), Luis Figueroa and Marisol Perez on August 7, 2007. The ACLU, MALDEF and LULAC met with Hispanic business leaders and members of the community at large later that day to discuss concerns about the OTCPA and strategies for combating its enforcement. Thornton, Jadwat, Figueroa and Perez traveled to Tulsa on August 8, 2007 to repeat their discussions of the previous day for concerned clergy, activists and the general public. At the invitation of Principal Mike Howe, Thornton and Cox visited Skelly High School in Tulsa on August 9, 2007 to speak with a group of parents, students and other interested parties about the OCTPA. As a result of Jadwat’s visit and consultation with representatives of MALDEF and LULAC, the ACLU has decided not to file a lawsuit at the present time. The various groups are continuing to gather information and plan strategy. Since it is important to observe how the State of Oklahoma will enforce the OTCPA, it is unlikely that litigation will be initiated prior to November 1, 2007.